We're all work as a team at TVMQG. 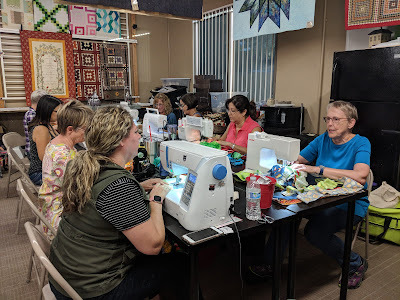 This month Jan is posting, Angelica was unable to attend the meeting and Patty took the photos so I could lead the meeting. 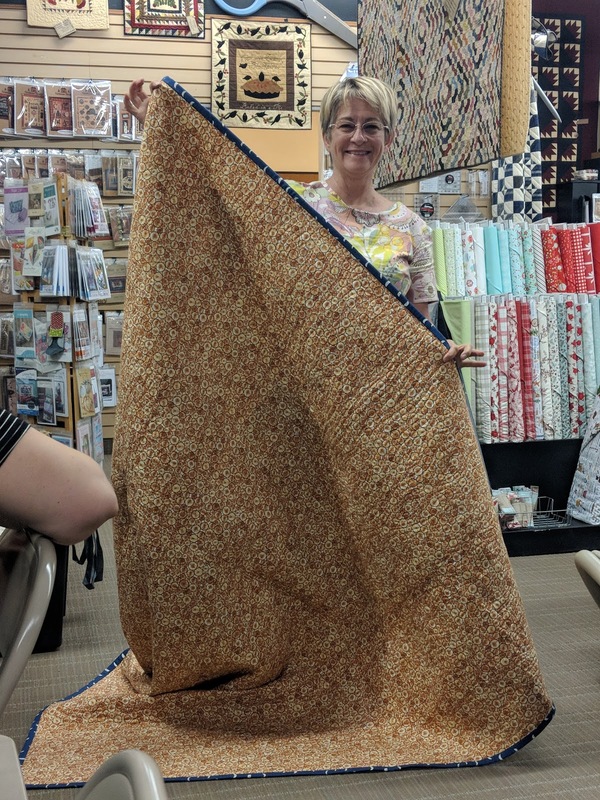 Here are the photos of my favorite part of the meeting, Show and Tell! Patty – Shared a quilt she made using a Jen Kingwell pattern and all Primitive Gatherings fabrics. 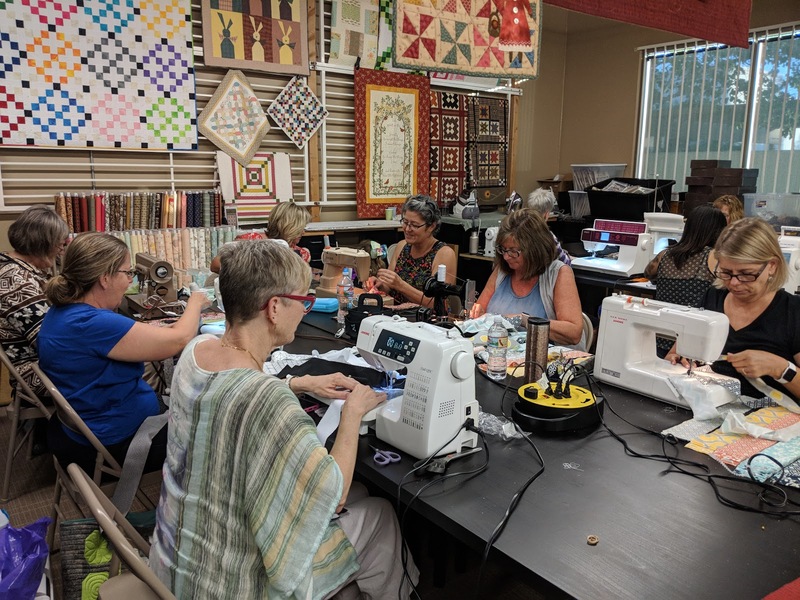 Colleen – Made a mini-pieced block for her San Diego Quilt Guild. 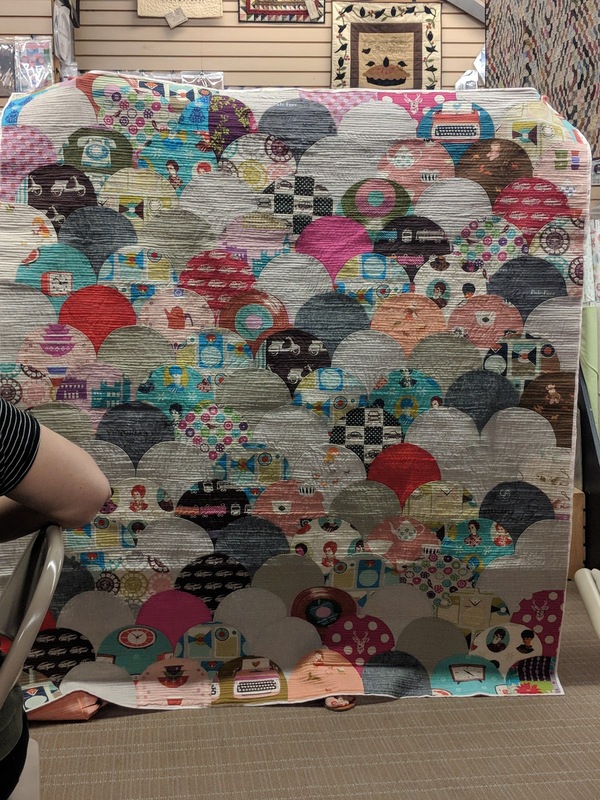 She made a mini “bear cub” quilt. 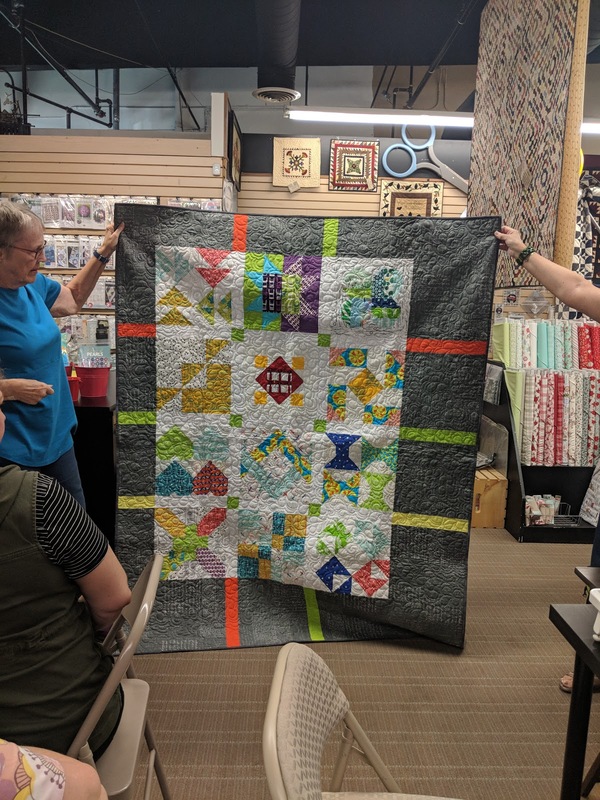 Jessica – Shared her finished jelly roll quilt top from our jelly roll race last meeting. 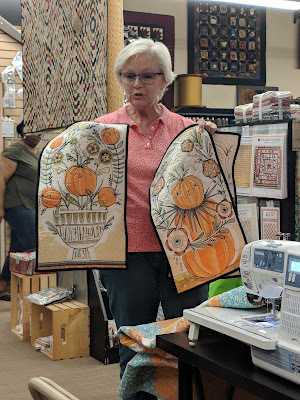 She also showed us a finished t-shirt quilt top she made for her neighbor. 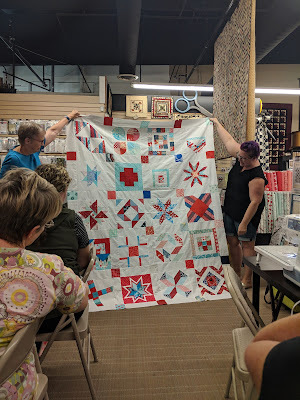 Rosanne – Shared her finished jelly roll quilt top from our jelly roll race last meeting. 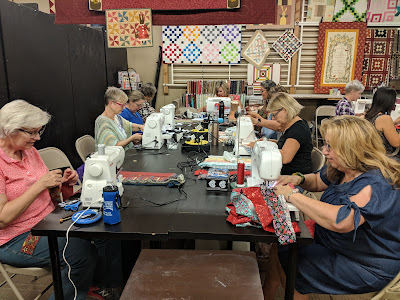 Jane – Shared a book she found called Trade Quilts by David Butler, pen name Parson Gray. The book is filled with more masculine looking quilts. 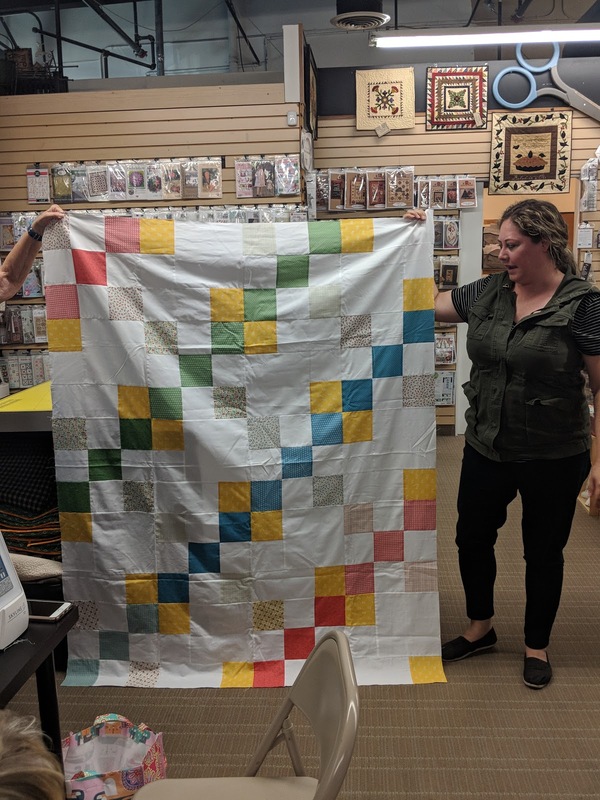 She shared a flannel quilt top she made for her nephew using a pattern from the book. 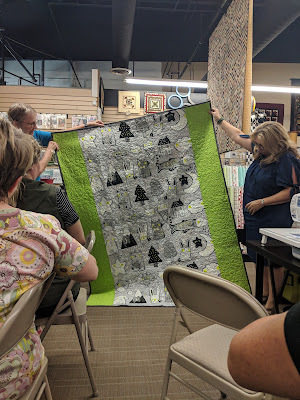 Jeanie – Shared a king-sized quilt top she made called Moonlight Senada. Madelynn – Shared the finished jelly roll quilt top from our jelly roll race last meeting. Linda – Shared the finished queen-sized quilt she shared last month when it was only a quilt top. Maritza – Shared a quilt she made using a new technique she learned called “one-block-wonder”. Susan – Shared her first hand-embroidered piece. She made a flowery throw pillow. She also repurposed a dog food bag into a useful tote. 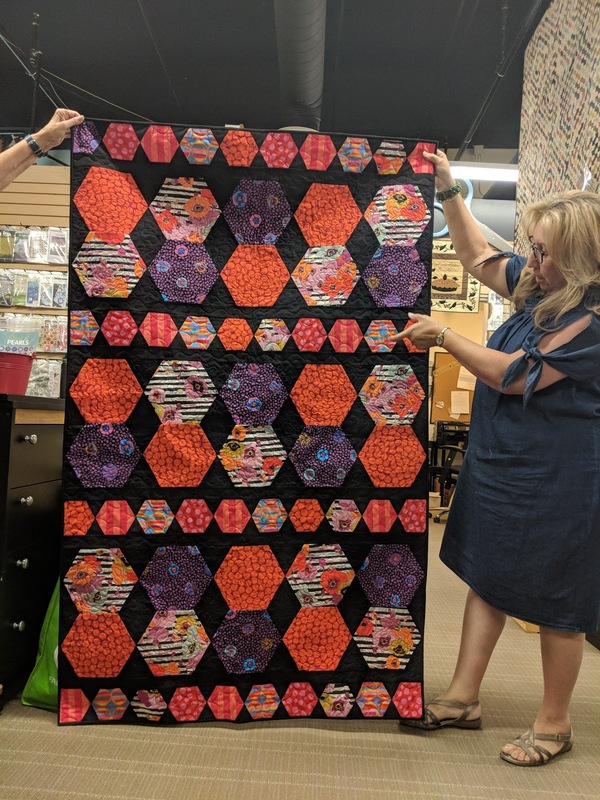 Jan presented the new Block of the Month, you can find all the info. here. Colleen did a great presentation/lesson on Color Theory. 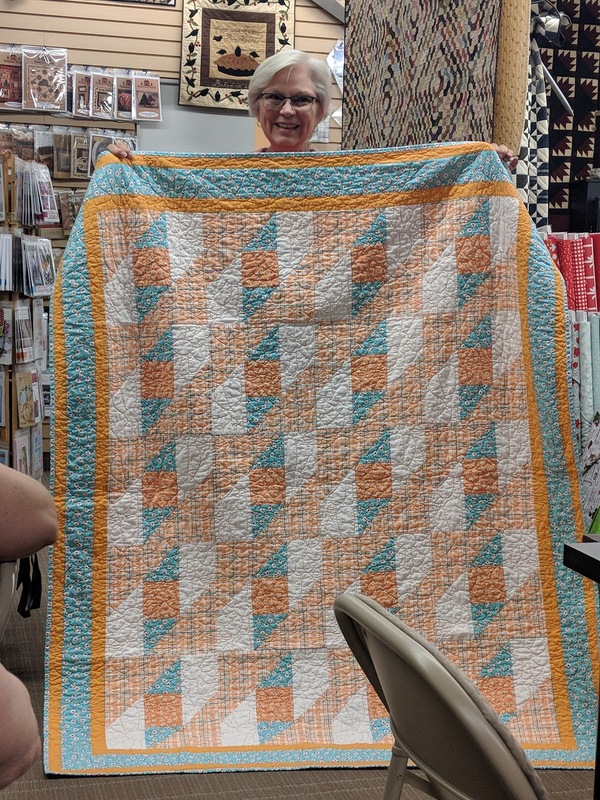 She's the BEST! 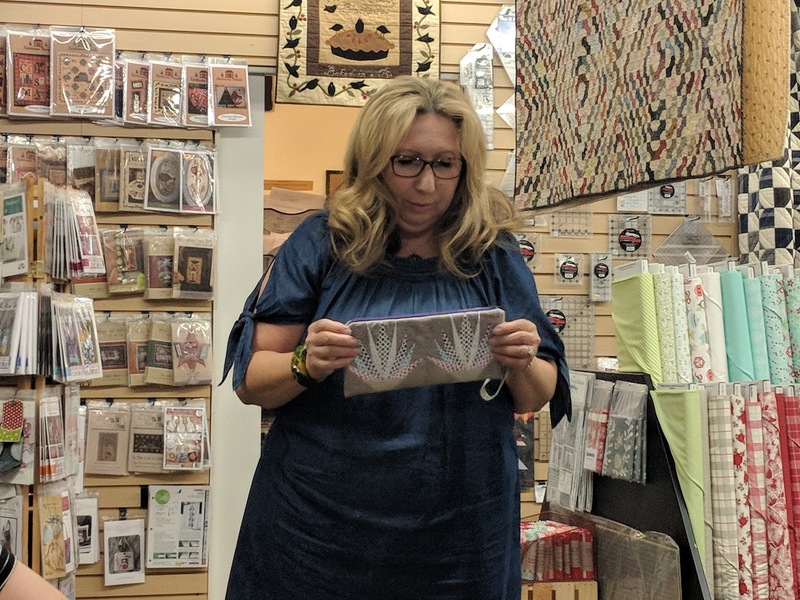 The winners of the door prizes are the Gift Card, Nancy, Easy Curves Kit, Patty, FQ bundle Maritza. Angelica didn't win anything this month, which is a record, OH she wasn't there! 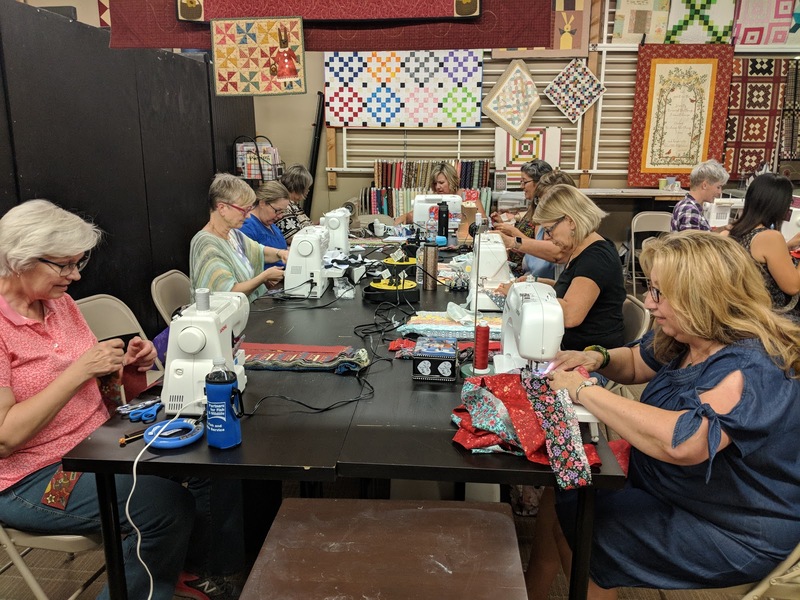 At the September meeting we're having our Annual Yard Sale, Susan will present the BOM and the Charm Pack Challenge Quilts are due. 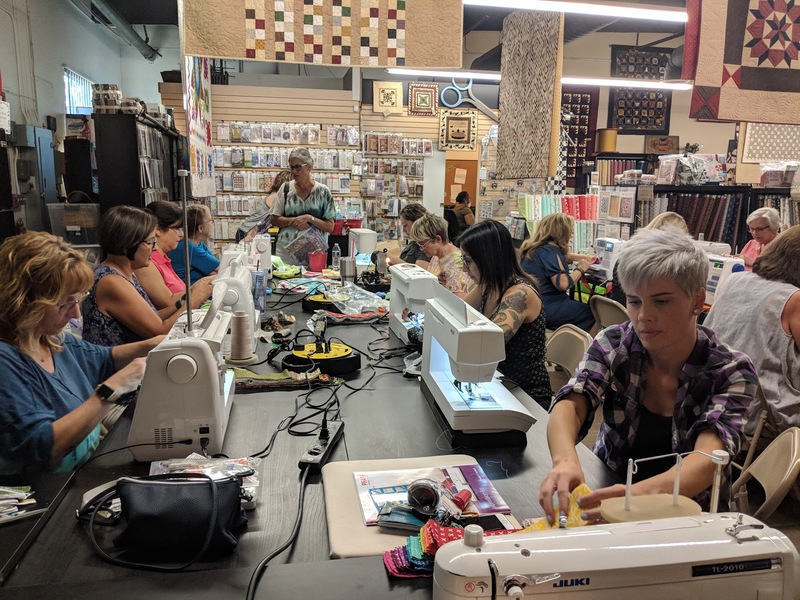 Jessica will be sending out an email for Sew Days to work on our Quiltcon Charity Quilt. 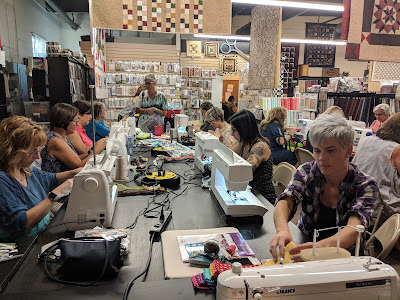 Jan started us off with some announcements. TO see those announcements you can reference the meeting minutes found here. 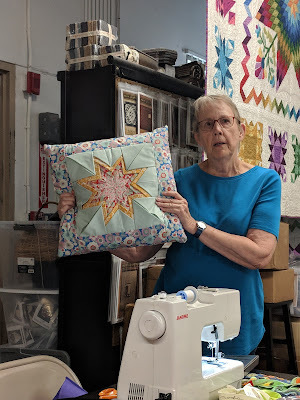 To start off Show and Tell, Jan showed us this pillow she made while she was in Norway. She showed us two quilts she made for her friend's 8yr old and 13 yr old. 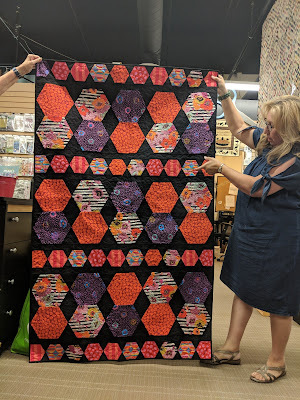 While working on our BOMs for the past few months, she'd made extra blocks for these quilts. 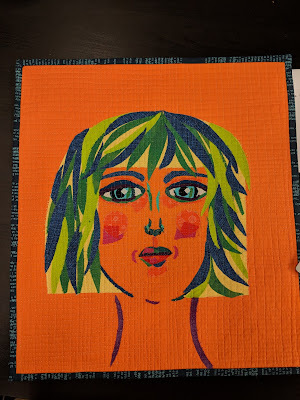 Colleen finished this quilt she made from a block swap she was a part of on Flickr in 2010. She will be donating it to the Quilts of Valor. 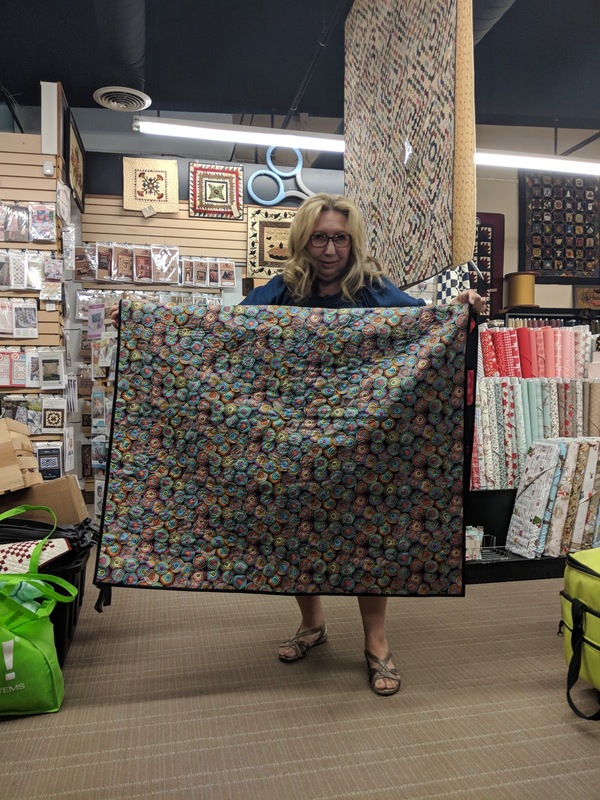 Before she moved from San Francisco, Colleen did a workshop in Santa Cruz with Latifah Saafir 4 years ago and made this clamshell quilt. 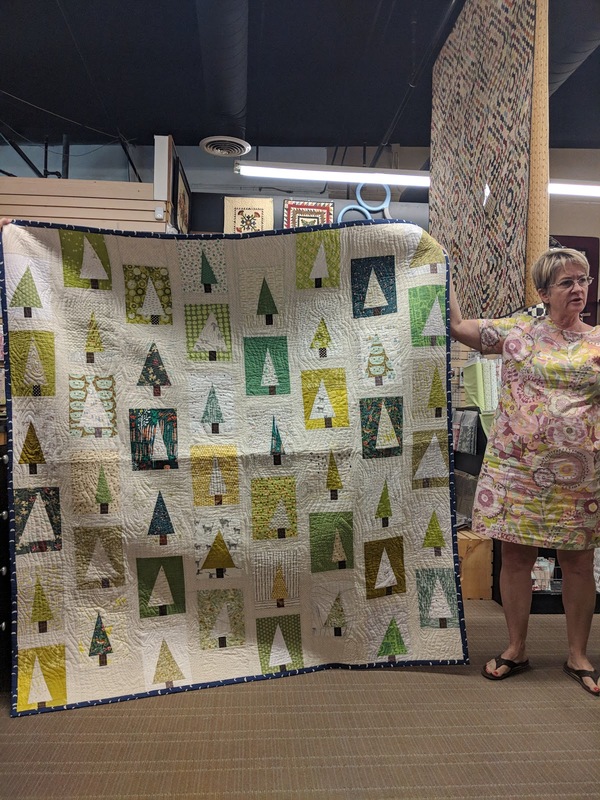 Susan made her tree quilt based on @diaryofaquilter's tutorial. You can find her on Instagram. 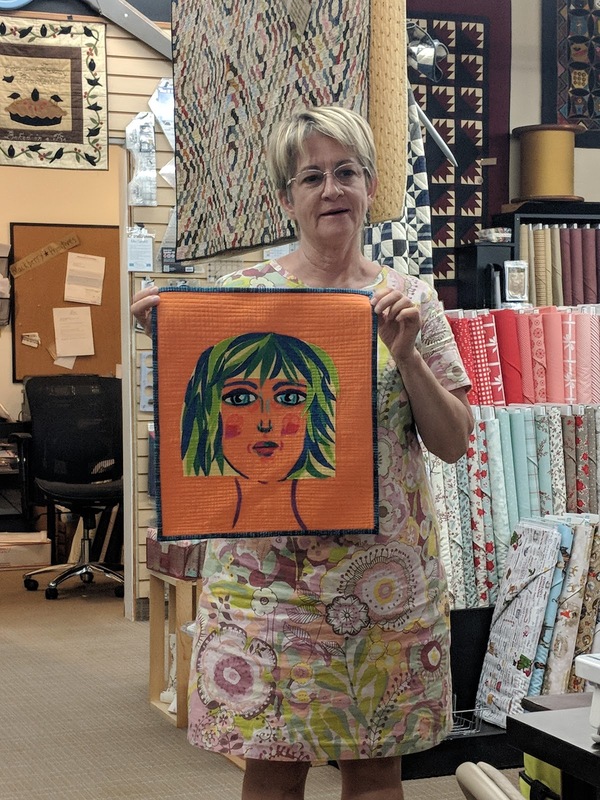 She also made this wall hanging based on Melissa Averinos' "Making Faces with Melissa" (@melissaaverinos on Instagram). 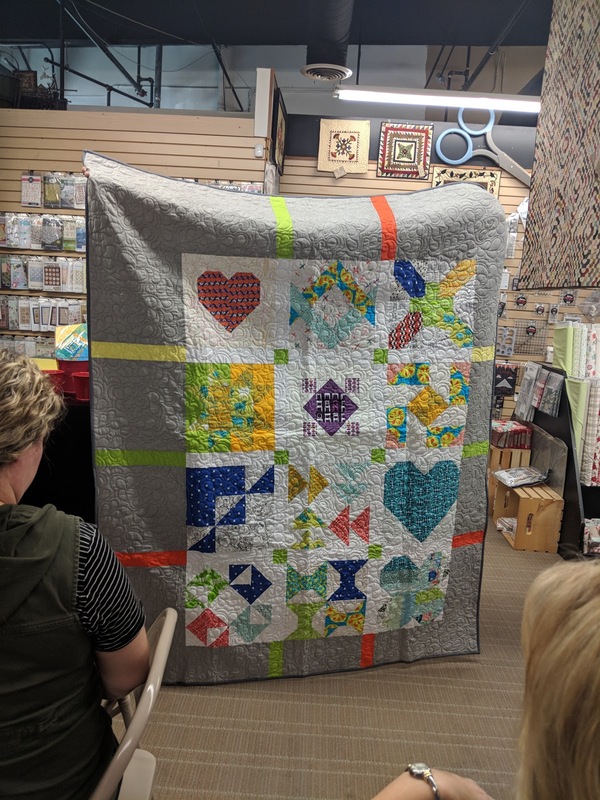 Jessica created this charm pack challenge quilt made from the charm pack she won last month. Maritza made this fun quilt from fabric she bought at quiltcon. 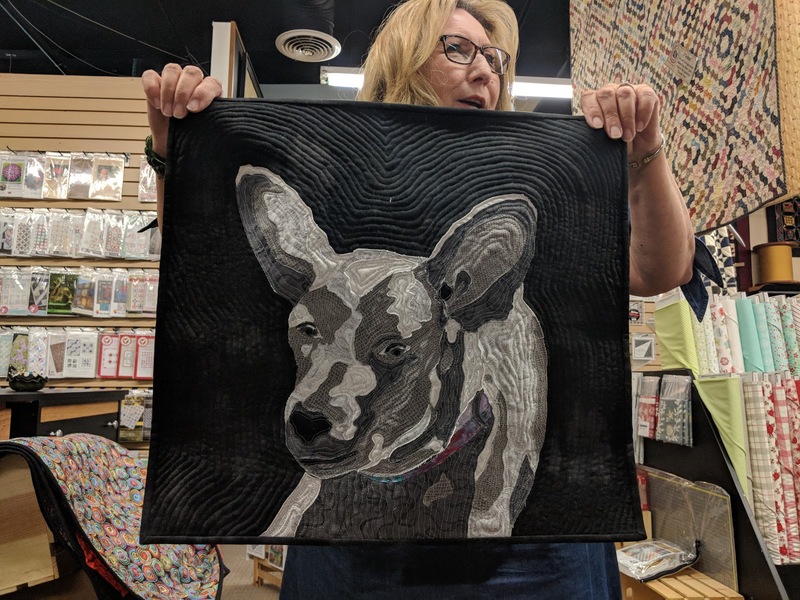 Maritza wanted to try new things so she made this stunning dog mini quilt using 5 different fabrics. 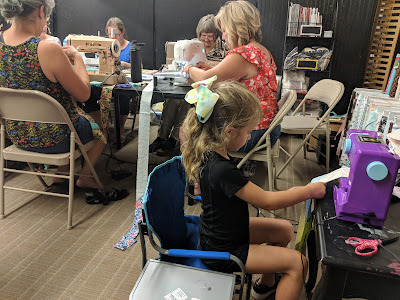 She had made 4 paper pieced pattern blocks and turned them into this cute wristlet. 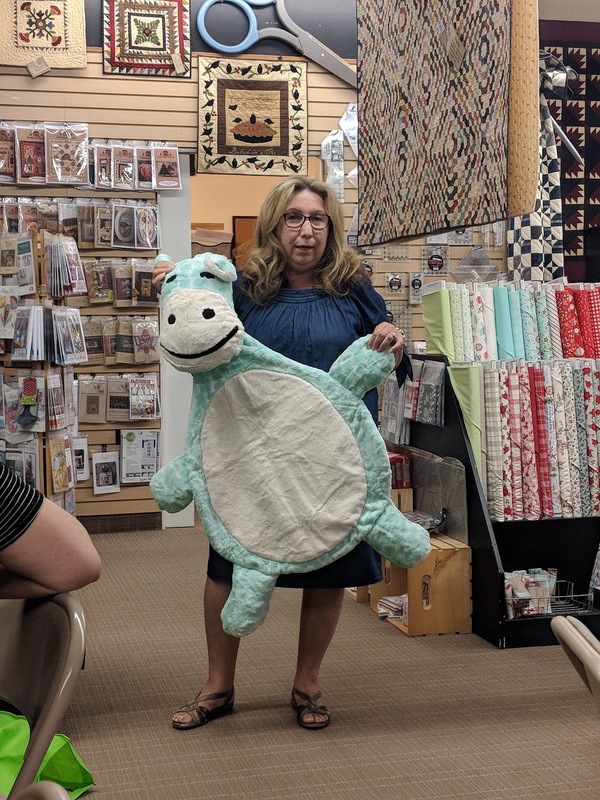 She made this cute plushie from her stash. 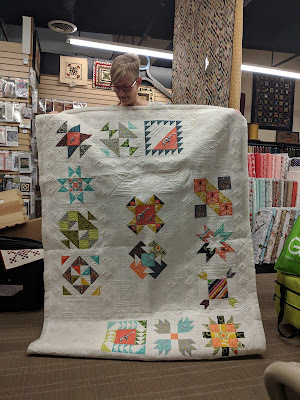 She had taken a class to complete this kit. Even though it proved to be incredibly difficult, it made it worth it to her once she saw her granddaughter laying on it and loving it. Linda made this quilt from the Dream Big Panel that she found on Hoffman's website. 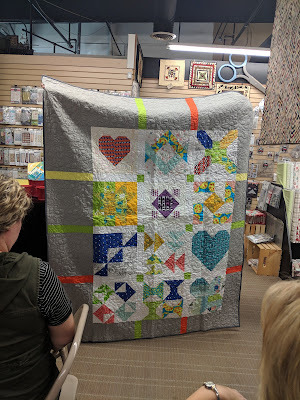 Nancy quilted this for her sister. 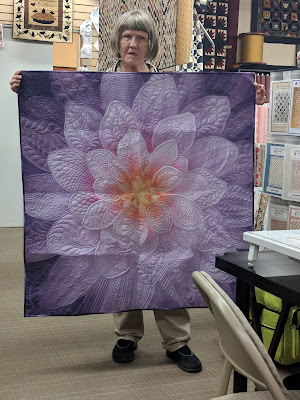 She used a UV light to quilt white on white. This visitor named Jan quilted this for her aunt. She also quilted these adorable Halloween panels. 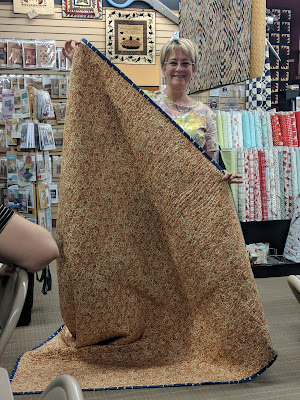 And then after Show and Tell we started our Jelly Roll Race! 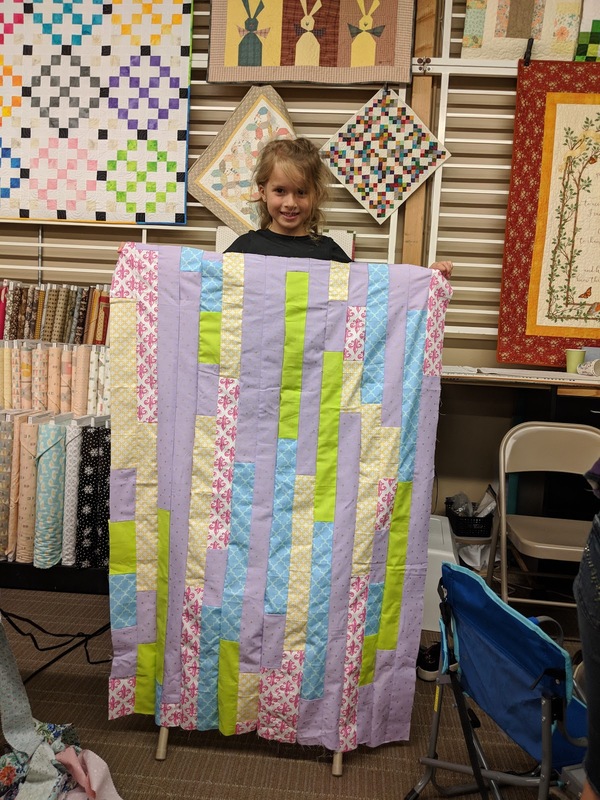 Alanice (our youngest member who had started hers before this evening) was the first to complete her Jelly Roll Race Quilt. 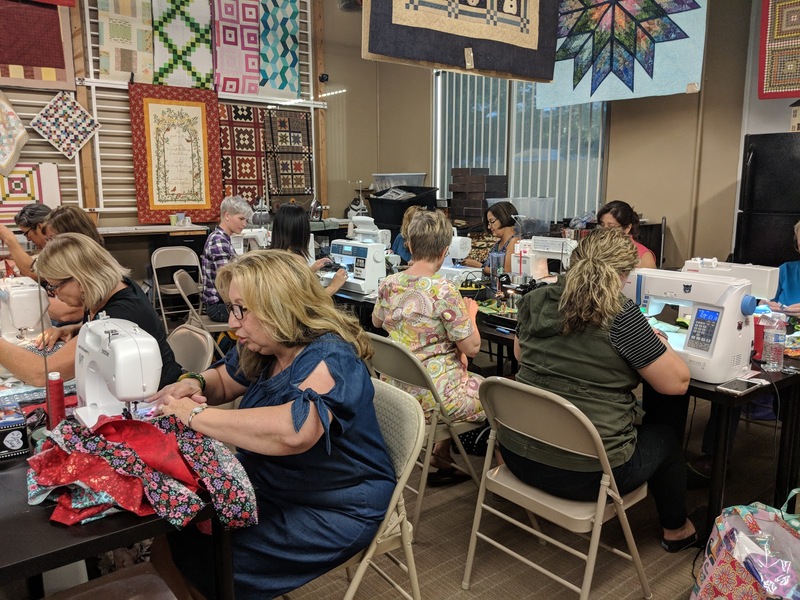 We hope to see you all (and our guests!) 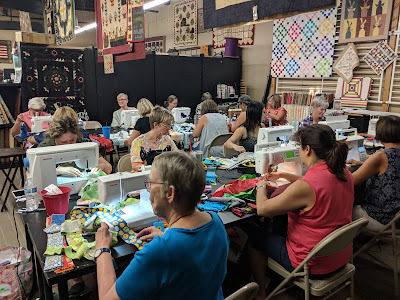 for our next month's meeting which will be held August Thursday August 16th.